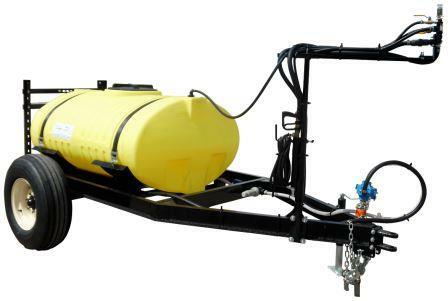 We offer a complete line of Trailer Sprayers. Some of our common sizes are 300 and 500 gallons. All of our Trailer Sprayers come with a UV stabilized plastic tank, roller pump, hand gun, strainer assembly, pressure regulator, 11L-15 implement tires, and powder coated frame. Our Trailer Sprayers are available with 21′ or 28′ break-away booms and boomless nozzles. Please contact our sales staff for questions or pricing.